The Taylor series for ‘f’ about x=x0. which is called as the Maclaurin series of ‘f’. Note that the nth Maclaurin and Taylor polynomials are the nth partial sums for the corresponding Maclaurin and Taylor series. Indeed every Maclaurin series is a power series in x. If a numerical value is substituted for x in a power series Σckxk, then the resulting series of numbers may either converge or diverge. This leads to the problem of determining the set of x-values for which a given power series converges; this is called its convergence set. c) The series converges absolutely (and hence converges) for all x in some finite open interval (-R, R) and diverge if x<-R or x>R. At either of the values x=R or x=-R, the series may converge absolutely, converge conditionally or diverge, depending on the particular series. This theorem states that the convergence set for a power series in x is always as interval centered at x=0 (possibly just the value x=0 itself or possibly infinite). For this reason, the convergence set of a power series in x is called the interval of convergence. In the case where the convergence set is the single value x=0 we say that the series has radius of convergence 0, in the case where the convergence set is (-∞, +∞) we say that the series has radius of convergence +∞ and in the case where the convergence set extends between –R and R we say that the series has radius of convergence R.
The usual procedure for finding the interval of convergence of a power series is to apply the ratio test for absolute convergence. The following example illustrates how this works. Example: Find the interval of convergence and radius of convergence of the following power series Σxk and Σxk/k! Both of which diverge, thus, the interval of convergence for the given power series is (-1, 1) and the radius of convergence is R=1. Σck(x-x0)k = c0+c1(x-x0)+c2(x-x0)2+…..+ck(x-x0)k+…… is called a power series in x-x0. 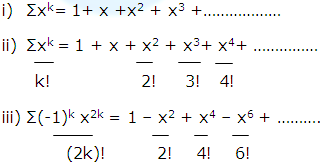 a) The series converges only for x=x0. b) The series converges absolutely and hence converges for all real values of x.
c) The series converges and hence converges for all x in some finite open interval (x0-R, x0+R) and diverges is x<x0-R or x>x0+R. At either of the values x=x0-R or x=x0+R, the series may converge absolutely, converge conditionally or diverge depending on the particular series. It follows from the above statements that the set of values for which a power series in x-x0 converges is always an interval centered at x=x0; we call this the interval of convergence. 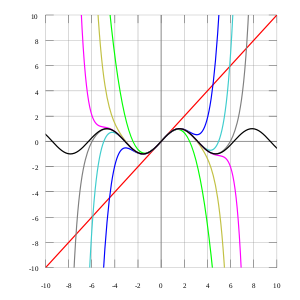 In part (a) the interval of convergence reduces to the single value x=x0 in which case we say that the series has radius of convergence R=0; in part (b) the interval of convergence is infinite, in which case we say that the series has radius of convergence R=+∞; and in part (c) the interval extends between x0-R and x0+R, in which case we say that the series has radius of convergence R.